Isn’t it always a dilemma to order from the menu? Especially a menu where every dish reads better than the next. Well, that’s where the restaurants have taken some pity on us and given us the option of set menus. Set Menus compress everything delectable into delicious multi-course meals. We have selected for you 5 mouth-watering set menus across town, that are perfect for a weekend dining out. One of Bengaluru’s finest Italian restaurants offers an excellent selection of signature dishes. They have two set menus at the price of Rs.2500 plus taxes. Enjoy options of antipasti, primas and dolci, which is the dessert. You will be hard pressed to find a place that serves better European food than what Loft 38 in Indiranagar has to offer. To cater to their wide clientele, Loft 38 has brought together the creative culinary talents of Chefs Vibhuti Bane and Altaf Patel. Together they have designed a menu incorporating Sushi and Japanese menus, along with some Indian influences. Set Menu curators GourmetItUp offer a sumptuous 3 course menu at just Rs. 485 per person. Om Made Café is guaranteed to bring a smile to your face. And not just for their quaint ambience but also their fresh and organic food. With roots in Anjuna Beach, Goa, this earthy café serves fresh and simple European food. Their GourmetItUp experience includes a three course organic menu paired with 3 glasses of Sangria. All this will cost you a mere Rs. 1274 / person. 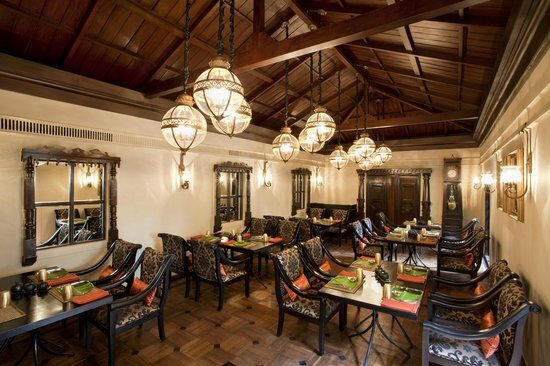 Karavalli is easily one of the finest seafood dining experiences in Bangalore. You can choose to be seated indoors, in the courtyard or the garden. The menu is very well designed and has delectable options. They have an interesting set menu option given the name ‘Tiffin’. Vegetarian Tiffin Carrier is priced at Rs. 1200 and the Non Vegetarian Carrier at Rs. 1400. A beautiful and sophisticated restaurant with fantastic food. That would be Smoke House Deli in a nutshell. We are yet to hear about a single dish that hasn’t satisfied the palates of epicureans across the city. GourmetItUp offers a 3 course experience with unlimited cocktails at a reasonable Rs. 1030 / person.